My own original character Superbatman unfortunately is not a member of the Marvel universe even though I've sent numerous drawings of him to the Marvel universe. I sent them to the Marvel universe, not Marvel comics. I simply read right on the weather channel to please send it to the Marvel universe and they've never been returned, so obviously they made it. If they would just given him a chance I know they would love him like I do. 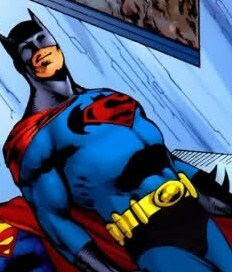 I have worked and I have sweated for Superbatman. Yet no one will give him the time of day and I do not know why. He's a great get; all he wants to do is be loved and I know he would fit into the Marvel universe. It would take some time, but I think he could be really good friends with Captain America. They would get along really well if Captain America would just try it, but they're all too scared of what a precious wonderful superhero he is. He can slay people like no other person could. His muscles are big, but his heart is even bigger. It's fine though. I don't think I thought that at times you must go alone. You must go alone in this world. You must learn to build for yourself and stand on your own two feet. It was Superbatman's dream to enter the Marvel universe, but if this is what he must do he will do it and he will show all of you, not out of pride or revenge, but because he knows he can meet the challenge. Sep 12 Dan Slott is a Monster!